Mortar mix is a critical important building component that must be combined thoroughly. Mortar is the bonding material between bricks, concrete block, stone, and many other masonry materials. It is made from Portland cement, lime, sand, and water in varying ratios. Each of the standard mortar mixes—Types N, M, S, and O—has different performance characteristics for different building applications. Mortar is mixed on-site in a mechanical mixer but can be mixed in smaller amounts by hand, using a hoe and a mixing tub or wheelbarrow. Use a dry bucket to measure out the materials. Pre-wet mortar containers before filling them with fresh mortar. Prepare a container with a flat, solid surface base and tall sides for mixing mortar, if mixing by hand. Add the masonry cement, lime, and sand in the appropriate amounts to your mixing container, then add water on top of the dry ingredients. Fold the mortar mix from the bottom into the water, when mixing by hand. Keep mixing until the water is mixed in. Then, add more water and keep mixing. Keep adding water until the mortar attains a smooth consistency. Stop mixing when the mortar is wet enough to slip easily off the shovel but holds its shape if you make a hollow in the mix. Mortar has attained the correct viscosity when you can make a few ledges in the mortar mix and ledges stand up. Always wear eye protection and waterproof gloves when mixing mortar. If the mortar starts to dry during application, add more water. Do not add water once the mortar begins to set. You can add chemical plasticizers or masonry cement to improve the workability of the mixture. Use a good grade of fine sand in your mortar mix. The sand should be free of clay material; otherwise, it will create a paste that could expand and contract as the water dries up. Cover the sand during storage so it does not absorb water, which could change your mortar mix water requirements. Each type of mortar mix contains different quantities of material. Be sure to use the correct type of mortar mix for the application. Waterproofing agent may be added to mortar for brick fences to prevent damp. To color mortar, add dye before mixing the mortar. 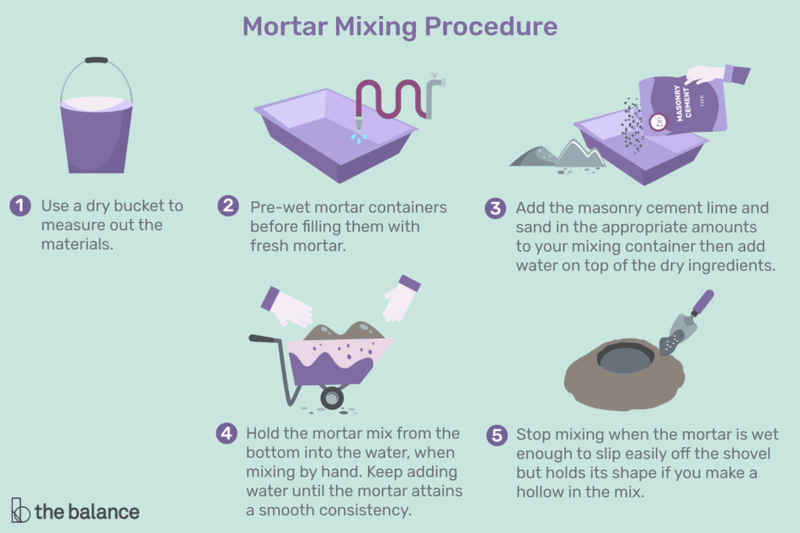 Successful mortar mixing relies on consistency. Try to use the same materials and use the exact amount of material batch after batch. You can use a pail or bucket to make sure you are using the same amount of material for subsequent batches. Mix mortar for not less than three minutes and not more than five minutes after the last materials have been introduced into the mixer or tub. When hand-mixing, be sure to add all components before adding the water. It is best to use fresh cement (unopened bags) when mixing mortar. Cement bags that are opened tend to absorb environmental humidity, thus changing the water percentage of the mortar mix. Portland cement is recommended for mixing mortar. Mortar is good for 90 minutes. After that time, discard the mortar because it starts to lose some of its characteristics. Weather can affect how mortar reacts and how manageable can be, so plan accordingly. It is important to understand that once the mix starts to set, it cannot be re-mixed because it will reduce the mortar's strength. Also, if too much water is added to the mix, it affects the chemical composition of the mortar, reducing its strength and potentially causing problems in the future. Adding the wrong admixture, such as dishwashing soap, also will affect the bonding and strength capabilities of the mortar mix. Many of pre-packaged mortar mixes have admixtures that are activated once they are mixed.